Cryptocurrencies are very popular now-a-days. People use to consider it as the future money. Let us have a look on what cryptocurrency actually is. 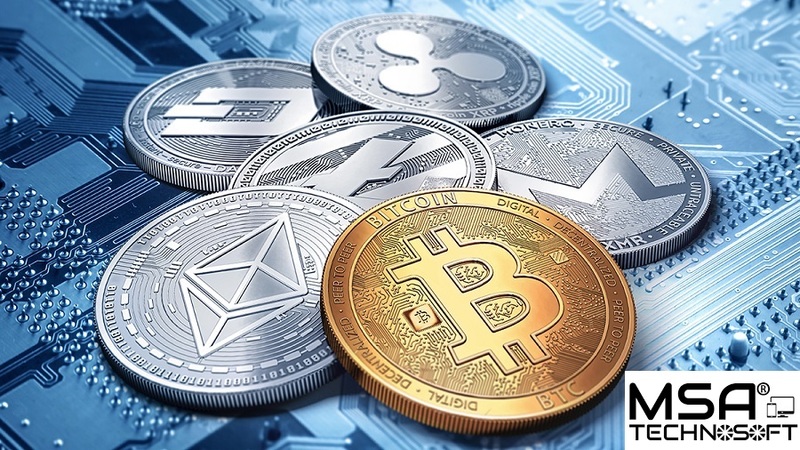 The term cryptocurrency or virtual currency refers to digital currency with encryption to regulate the generation of units of currency and verify the transfer of funds, operating independently of a central bank. It uses cryptography or encryption algorithm for secure transactions and verify asset transfer. It is designed to work as the medium of exchange. Cryptocurrencies have decentralised control that means it is not issued by any central authority. Cryptocurrencies uses extremely complex code systems that encode sensitive data transfers to transfer their units of exchange securely. These protocols also hide the identities of the miner i.e. ; cryptocurrency user, making transactions and fund flows difficult to attribute to specific individuals or groups. The term Decentralised control means supply and value of cryptocurrencies are controlled by the activities of their users and highly complex protocols built into their governing codes, instead of the conscious decisions of other regulatory authorities or central banks. Cryptocurrencies can be exchanged with fiat currencies digitally. Each of them has a variable rate of exchange with major world currencies like dollars, yen, euro etc. Cryptocurrencies are beneficial because of its political independence and extreme data security, miner (cryptocurrency users) enjoy benefits not available to users of traditional fiat currencies and their respective financial systems. The decentralized control of each cryptocurrency works through a block chain. Blockchain is a public transaction database that function as a distributed ledger. Providing a data structure for this ledger is exposed to a limited threat from hackers and can be copied across all computers running Bitcoin software to lower transaction costs by making payment processing more efficient. Cryptocurrencies does not have any central repository, they are virtual. In case, if the backup copy of holdings does not exist, cryptocurrency balance can be cleared by a computer crash. Since the values are based on supply and demand, the exchange rate of cryptocurrency can fluctuate widely. Cryptocurrencies also contain a lot of risks and drawbacks, such as illiquidity and value volatility, that don’t affect many fiat currencies. Cryptocurrencies are frequently used to facilitate grey and black market transactions that is the reason why many countries does not trust on it. Some proponents choose cryptocurrencies as potentially lucrative alternative, while some serious financial professionals find them suitable for anything other than pure speculation. Satoshi Nakamoto, the unknown inventor of Bitcoin, announced in late 2008 that he developed a Peer-to-Peer Electronic Cash System. In his invention he found a way to build a decentralized digital cash system. After all the failed centralized attempts, Satoshi tried to build a digital cash system without a central entity same as a Peer-to-Peer network for file sharing. This is how cryptocurrency invented. Bitcoin was the first cryptocurrency invented in 2009. Since then, so many cryptocurrencies have been created. They are called Alternative coins or altcoins. Cryptocurrency is digital cash that works on the basis of Blockchain and Cryptography. Here each and every transaction is recorded in a public digital ledger known as Blockchain and for the security reasons every transaction is secured with cryptography. It express its value in units. The working of cryptocurrency is quite similar to a bank credit on a debit card. In both the cases very complex system work to allow people to send and receive currencies electronically and manage the record of transactions. The huge difference here is that an algorithm keeps record of currency and transactions instead of government or banks. “Cryptocurrency wallets” is a software use for transactions between peers. The person making transaction uses this software to transfer balance from one account to another. AKA private key i.e. password for the account is required for fund transfer. Peer-to-peer transaction is encrypted and broadcast to cryptocurrency’s network. The transaction record is then queued up to be added to the public ledger. The transactions are then recorded to the ledger called Block chain. The transaction amounts are public but the senders are encrypted. All the users of a given cryptocurrency can access the ledger by downloading full node wallet. Each transaction has its own unique key, the owner of those keys can have the amount of cryptocurrency associated with those keys. When a cryptocurrency transaction is made, that transaction is sent out to all users hosting a copy of the blockchain. Specific types of users called miners then try to solve a cryptographic puzzle (using software) which lets them add a “block” of transactions to the ledger. Whoever solves the puzzle first gets a few “newly mined” coins as a reward. People who are running software and hardware aimed at confirming transactions to the digital ledger are cryptocurrency miners. Solving cryptographic puzzles via software to add transactions to the ledger (the blockchain) in the hope of getting coins as a reward is cryptocurrency mining. Cryptocurrency wallets with unique information confirms that the user is temporary owners of their units. Private keys confirm the authenticity of a cryptocurrency transaction. Wallets lessen the risk of theft for units that aren’t being used. Wallets used by cryptocurrency exchanges are somewhat vulnerable to hacking. Doesn’t matter whether Cryptocurrency Wallets are stored on the cloud, internal hard drive, or in external storage, at least one backup is strongly recommended. Backing up a wallet doesn’t duplicate the actual cryptocurrency units, merely the record of their existence and current ownership. Bitcoin is the most widely used cryptocurrency in the world. This is the first digital currency introduced in 2009. Programmed supply unit is 21 million bitcoins. Litecoin was initiated in 2011. The basic structure is same as Bitcoin. Programmed supply unit is 84 million. It is second or third most popular cryptocurrency in market capitalization. Ripple was released in 2012. It is known for its consensus ledger system that speed up transactions and reduced block chain creation time. Ethereum was launched in 2015. It came with some changes in the basic structure of bitcoin. It uses smart contract feature.